Teaching Blog Round Up: Sight Word Fun! 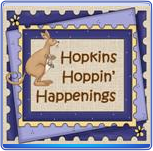 Hi, it's Brian from Hopkins' Hoppin' Happenings. I am excited that my day has rolled around to blog for you all. Awhile back on my blog, I blogged about a fun center that can be used for sight words and thought I would share it with all of you. This one can also be used for letters or numbers. The student would take a large index card and write the sight word they are learning in pencil. Then trace it with glue. Next with the index card in a tin tray or something similar they sprinkle on some colored sand until it covers all the glue. Then they hold up the index card and shake out the leftovers. Let it dry. Later in the day or the next day they can trace over the letter with their hand and practice writing it! 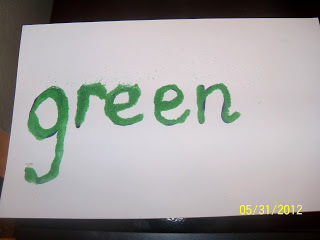 Here's an example for learning the color word green with sand art. Do you want more sight word fun? Check out my fun Fishy Blast Sight Words game for FREE! Children read a sight word and then turn over cards to earn points. They can turn over as many as they want to add to their total on each turn, however, if they get a 0, they lose all points from that round and all over rounds! I have many other versions of this game available for purchase, even for older students! 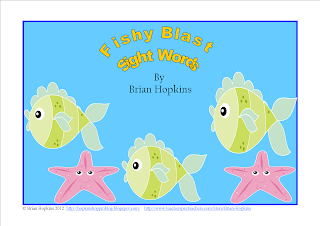 Click the picture or the hyperlink to get Fishy Blast Sight Words for free. I would appreciate you taking a minute of your time to give me a nice rating. Click on my button and become a follower if you would like to check out other fun ideas and get more freebies from me! Thanks for hoppin' by today!